This Italian wedding soup is nothing like the one in my memory, most specifically, the one I used to devour by the Styrofoam bowlful between waiting on customers at the cafe where I worked just out of college. The soup was made with an incredibly greasy broth and filled with a million mini meatballs, a few strands of spinach and a handful of these little lentil-shaped pasta noodles. I think there may have been a few specks of diced carrots, too. Along with about a gallon of salt. It was delicious — and not good for me at all. 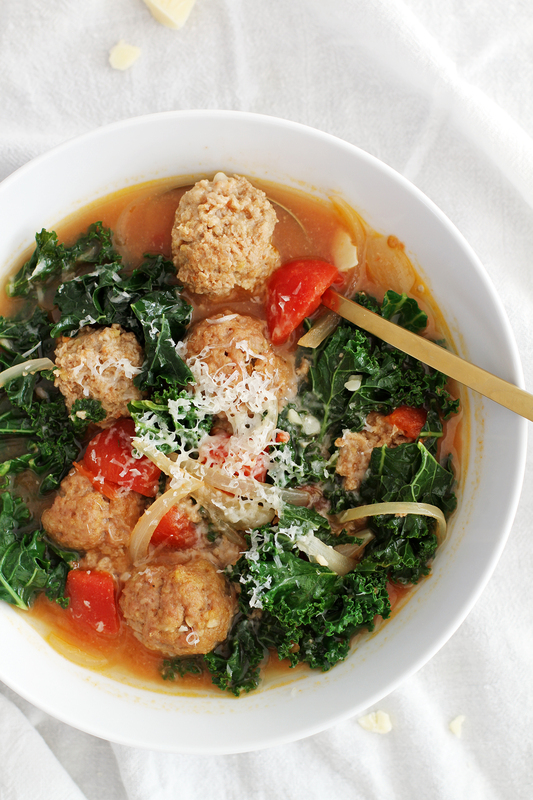 This lighter Italian wedding soup is nothing like that soup. Instead of greasy, salty broth, this soup is made with low-sodium broth and diced tomatoes with their juices. Instead of a million mini meatballs, this soup is made with more substantial turkey Parmesan meatballs that poach in the broth to tender perfection. 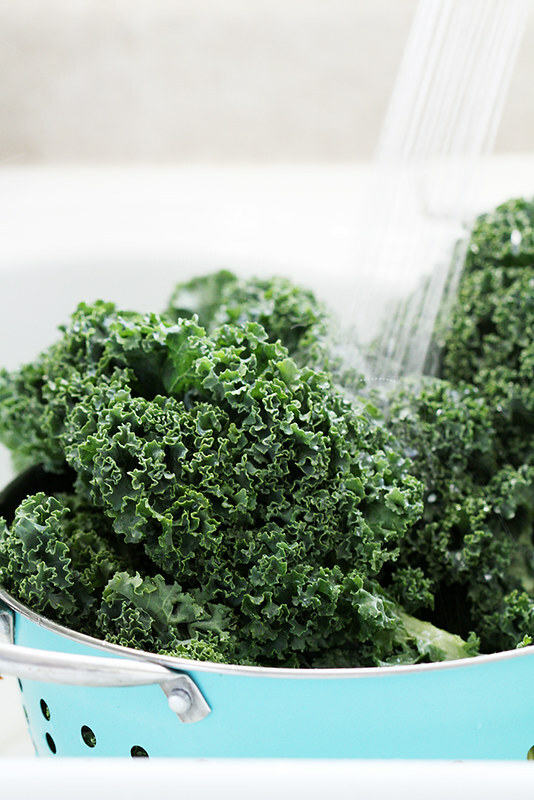 Instead of a few strands of spinach, this soup is filled out with an entire bunch of curly kale. It’s all done in 30 minutes, and then you top it with more Parmesan cheese. So yeah, this soup is nothing like that soup — it’s much, much better. This week’s dinner routine has been an exercise in “homemade and healthy, but hearty.” Considering we are fresh off a cruise ship where food was plentiful anywhere at any time (I’m looking at you, 24/7 pizza parlor and serve-yourself frozen yogurt station and those dang cookies at the buffet that were IRRESISTIBLE), we are in desperate need of some healthier homemade food. But also considering that it’s approximately -10 degrees outside as I write this and I’ve perma-wrapped myself in a blanket burrito, we also need food that sticks to the ribs. 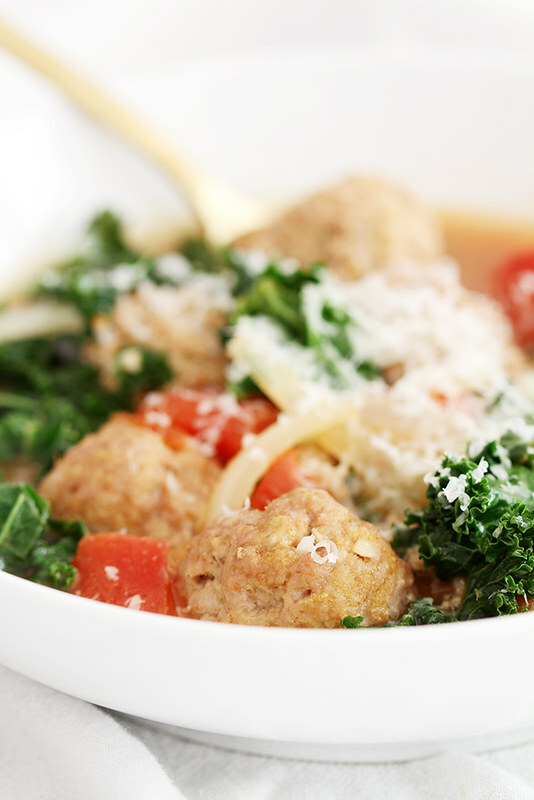 Lighter Italian wedding soup fits into all categories perfectly. The fact that it’s flavorful and done in a half-hour are just really sweet bonuses. The cherry on top of it all is that this soup freezes well, so you can save half of it for dinner down the road or make a double batch today, freeze one batch and when you need it — boom, instant dinner party. Just add a hunk of Parmesan cheese to grate on top, a loaf of crusty bread and a bottle of vino and everyone is happy. Bellies included. Goodbye, greasy salt-bomb Italian wedding soup of yore. 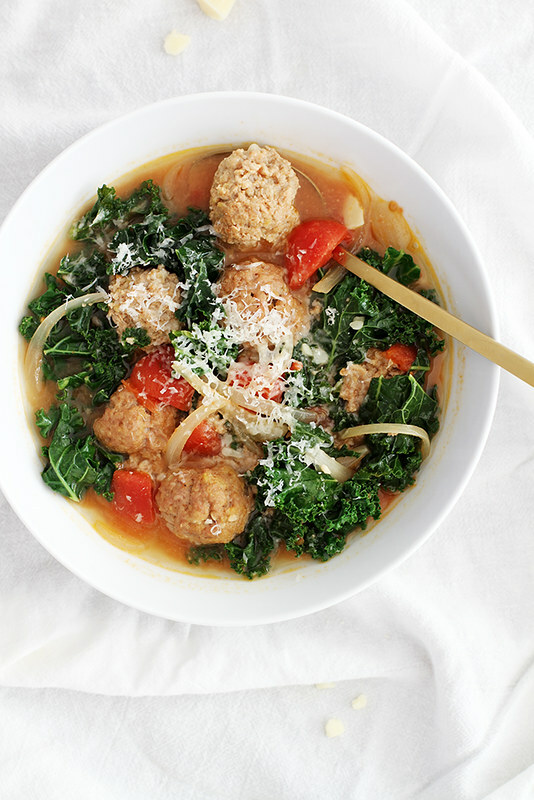 Hello, lighter Italian wedding soup of my dreams. In large bowl, combine ground turkey, breadcrumbs, Parmesan cheese, garlic, egg, salt and pepper until well mixed. 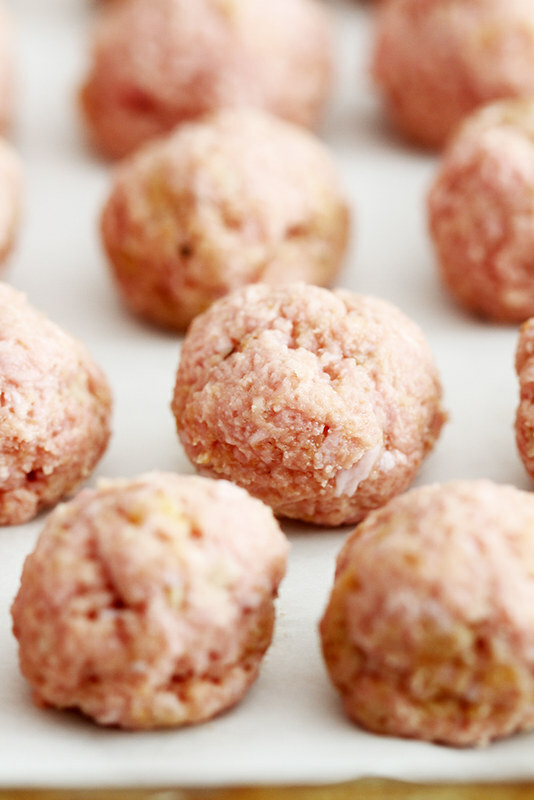 Shape into 1-tablespoon balls. Heat oil in large saucepan over medium heat. Add onions and cook, stirring often, 4 to 5 minutes until softened. Add broth and diced tomatoes. Bring to simmer over medium-high heat. Add meatballs and cook, without stirring, 5 minutes until meatballs float to surface. Add kale (in batches, if necessary) and stir very gently, being careful to disturb meatballs as little as possible (they are very tender). 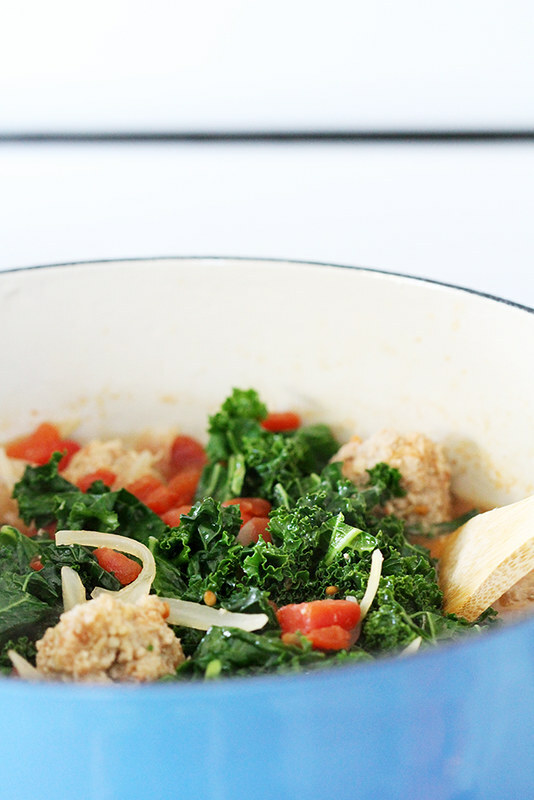 Cook 3 to 5 minutes more until kale is wilted and meatballs are cooked through. Thin soup with water, if needed, and season with more salt and pepper to taste. Serve sprinkled with cheese. This soup sounds SO much better than the one you used to eat – it looks seriously amazing, and absolutely perfect for the super cold rainy days that we’ve been having in Seattle. I want to dig into a big bowl of this! Rachel — Oh, SOOOO much better. 😉 Thanks, dear! I am all about the meatballs these days. Great recipe dear! See you soon!!! This looks awesome! I think I’ll run to the store so i can make it tonight! Sounds good. Do you have nutritional information? Clories per serving? This was a very bland soup. Tasted like watered down tomato soup. A little Italian seasoning would help some but was not included in the list of ingredients. All in all, it is too bland for me.